NEW YORK (CNS) — Fans of 2017’s “A Dog’s Purpose” may be anxious to catch the quest-based adventure “A Dog’s Way Home” (Columbia). 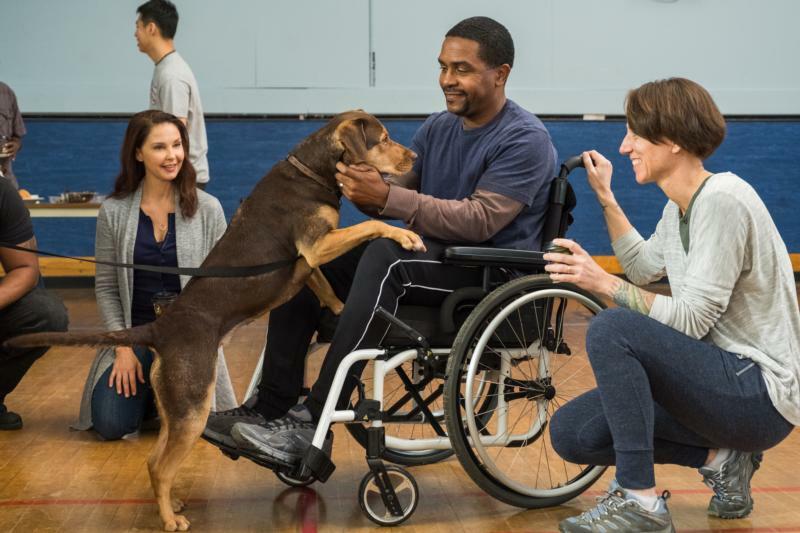 Both movies are based on novels by W. Bruce Cameron (who co-wrote the current screenplay with his wife, Cathryn Michon) and canine cuteness abounds in both. Yet, though billed as a family film, director Charles Martin Smith’s adaptation features various elements that make it unsuitable for youngsters. They include not only frightening scenes but an interlude quietly advancing the relentless Hollywood drive to mainstream homosexuality. Bryce Dallas Howard provides the voice of the titular pooch who serves as the story’s narrator. Raised in a little community of stray cats and dogs living under an abandoned building in Denver, the pit bull-mix puppy spontaneously decides that affectionate medical student Lucas (Jonah Hauer-King), who periodically leaves food for the felines, is the human for her. So she jumps into his arms and is promptly adopted. Bella, as Lucas dubs her, settles down into a happy domesticated life, winning the hearts both of Lucas’ psychologically scarred veteran mom, Terri (Ashley Judd) — a victim of post-traumatic stress disorder — and of Olivia (Alexandra Shipp), the girl Lucas would like to make his own. Bella also becomes a much-loved fixture at the Veterans Administration hospital where Lucas volunteers. But Lucas has run afoul of coldhearted real estate developer Gunter (Brian Markinson), whose effort to knock down the structure under which Bella was reared Lucas has successfully thwarted, insisting that all Bella’s old pals be given a home before the demolition commences. The fact that local animal control officer Chuck (John Cassini) has it in for Bella is, we eventually learn, no coincidence. Vulnerable because of local anti-pit bull ordinances, Bella is subject, under certain circumstances, to impoundment and even euthanasia. So Lucas decides to send her away to live with Olivia’s sister in New Mexico until he and Terri can move to a new house beyond the city limits. Grown-ups, especially those with a soft spot for cuddly creatures, will take all this in stride. They should be aware, though, that there’s little on offer here beyond a lovable face, a waggly tail and some droll dog’s-eye-view commentary on human behavior. The film contains considerable peril and a benignly viewed homosexual relationship. The Catholic News Service classification is A-III — adults. The Motion Picture Association of America rating is PG — parental guidance suggested. Some material may not be suitable for children. If they’re going to put a homosexual couple in the movie, the rating should be higher. I would not have taken my 11 year old niece to watch that. They could have easily made the couple just two friends and not a couple.